If you don’t have at least one negative online review, you will. It’s the world we live in today and every firm needs a strategy for dealing with bad reviews. In late 2013, I was contacted by Tom, the managing partner of a 10-attorney litigation boutique, about helping his firm improve their overall marketing direction. I was a couple years out of my sales career and it showed, because I made a cardinal error early in our meeting. I showed Tom a negative review someone had posted about his firm on Google. I spent the rest of the meeting trying to regain Tom’s attention. The negative review absolutely consumed him. He couldn’t understand why someone would possibly write a bad comment about his firm, and he was even more distraught that the person was allowed to do so anonymously. I could have helped Tom and his firm, but we never got that far. Expect to get some negative reviews. I’ve seen everything from very legitimate ones, to ones where the reviewer actually had the wrong law firm because of a similar name. Certainly, competitors have posted negative reviews against other law firms in the past, and that won’t stop anytime soon. When you respond, you invite the reviewer to post even more damaging stuff about you, exasperating the problem further. When you respond, you have shown the reviewer you care, which gives them an incentive to post bad comments on many other review sites. Most bad reviews are poorly written and ooze with irrationality which will cause future readers to dismiss them. It’s much more powerful to have your positive reviews fight your reputation battle. Don’t lose sleep over it. Whether it’s a valid critique or outlandishly false, it won’t help you to dwell on a negative review. Ask the review site to remove it. It is generally not easy to have any type of review taken down by the publishing website. However, some do have “community guidelines”, the violation of which will cause a review to be pulled down. Usually the language must be threatening or vulgar, but it does not hurt to submit a removal request. Keep in mind, however, that the publishing site will often contact the reviewer before removing it, which can trigger the additional problems in 2(a) and (b) above. Bury negative reviews in positive ones. If 37 out of 40 reviews about the TV you’re interested in are excellent, you will dismiss the 3 people who gave it low marks as being impossible to please. This psychology is no different for your law firm. Don’t have staff members post fake reviews. As soon as you have to let a person go, they will have something unethical you’ve done hanging over your head. 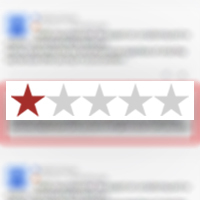 Don’t post your own positive reviews. There are some cases where review sites have sued lawyers for posting bogus reviews. These cases are complicated, and often involve an initial lawsuit filed by the law firm, but you don’t want something like that coming out later, as unlikely as that would be.